What has to be THE story of the young 2008 baseball season is the continued success of small market, low payroll teams. We’ve seen the crazy records and stats early in the season before, and we don’t pay much attention to the Orioles undefeated record if they start 3-0 or start chanting MVP when Joey Gathright is hitting .670 in the first week of the season. Baseball fans understand that baseball is a long season and things even out in the end. It’s “win 60, lose 60” as the old adage goes. (Don't you think that they could have squeezed that line into Field of Dreams? )So, we are now a month in and some of those teams that are supposed to take their inevitable slide haven’t. Yes, I think Carl Crawford is a superstar, but I think the casual fan would be hard pressed to name another player on the Rays. Still, they hit just .5 game behind the Red Sox for first place in the AL East. Their 6 games over .500 record is the best in franchise history and they are in the top ten in just about ever relevant offensive and pitching statistical category. How do they do it? After all, the Yankees line-up has been getting similar production yet are looking up (and scratching their heads) at the Rays. It all comes down to pitching. The Rays young starters all average over six innings per start, which keeps their bullpen fresh. James Shields has already thrown two complete games. This has allowed their bullpen to combine for only six of their sixteen losses. Anchored by Troy Percival who has 9 saves and a 1.93 ERA, the Rays are not giving opposing line-ups a break. Best record in the AL! Is this a Moneyball Renaissance? The formula is the same the Rays. Their starters have been able to consistently go long, not quite as long as the Rays, but that’s ok since their bullpen is 8-2 with a 2.79 ERA. Huston Street is 9 for 11 in save opportunities with 18 K’s in 16 IP. The A’s have the third lowest runs against total in baseball with only 145 RA. Johann who? With the White Sox and Tigers becoming powerhouses most believed the Twins dominance of the AL Central had come to an end. But if you notice the pattern here, Livan Hernandez and company have led the Twins atop their division. The starting rotation is .500 at 13-13 with a 4.68 rotation – nothing special there. But their bullpen is 7-4 with a 3.32 ERA and Joe Nathan is a perfect 12 for 12 in saves with a 1.93 ERA. The Twins find themselves in the bottom half of the league with only 165 runs scored but are still pitching their way out of games. So are these teams all going to make the playoffs? Will the Yankees and Red Sox outslug the Rays for the AL East title? Will the Angels and Tigers land more superstars at the trade deadline to surpass the A’s and Twins? These scenarios are quite possible. The season is, of course, still very young. So what can we take way from these statistics? I think it’s pretty obvious. Consistent pitching is the key to winning. The ability for starters to go long keeps the bullpen fresh and avoids the dreaded “big inning.” Bad performances from the bullpen are not merely the consequence of bad pitchers in the bullpen (as Yankee fans often get overly caught up with). Granted, a team’s best pitchers are on the starting staff but factors such as overuse and being brought in to pitch in the middle of innings can equally contribute. If you have already figured out that this is a not-so-veiled criticism of the Yankees then you are one smart cookie. Hank Steinbrenner needs to stop complaining about how the “pitching experiment” is not working and how we need to start signing free agents. Maybe the dynasty Yankees did have a lot of free agent pitching, but those pitchers were not former all-stars whose good outings culminated in being lifted in the 5th inning. 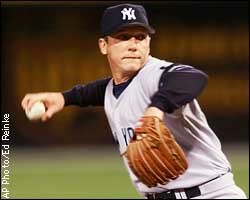 The great “free agents” like David Cone were workhorses (Cone threw 146 pitches in Game of the 1995 ALDS). It seems if Steinbrenner had his way, Randy Johnson (44 years old) and David Wells (45 years old) would back in pinstripes. So let’s put down out checkbooks and wait and see what happens. You obviously haven't been paying much attention to baseball recently because the same thing happens every year. Marginally talented teams get hot early and jump out to fast starts, only to fall back to the pack by the end of the season as the more talented teams win out. Sure maybe a couple more are small market teams this time, but I hardly think this is a "big" story. The only reason these small market teams are competing is because the favorites are because A) the favorites are struggling themselves or B) they are in a terrible division. Having said that, you wonder if the Twins are regretting the trade of Santana. I guess that had to do it so they could get something in return. If he were still there to lead the rotation, they could put some serious distance between themselves and everyone else.